SAN FRANCISCO, CA--(Marketwired - Apr 7, 2016) - Kickfurther, a leading inventory and invoice financing crowd-funding platform that connects companies and backers seeking qualified short-term deal financing, is proud to announce it has successfully completed pureWOD inventory financing through its crowd-funding platform in just 1 week. pureWOD, an all-natural paleo-approved, and doctor developed whole food based supplement company, raised 30,038.86 USD through KickFurther investors and is expected to payout a consignment profit of 14% over a projected offer term of 10 months. In this Kickfurther campaign, pureWOD funded their inventory for products that don't have any fillers, chemicals, artificial flavors or sweeteners. The inventory will be shipped to pureWOD in the name of their Kickfurther backers and the brand intends to provide a total payout of 34,244.30 USD. pureWOD customer's biggest pain point is a healthy carbohydrate source for after their workout as well as getting as many micronutrients (veggies and fruits) throughout the day. Their most recent products are a sweet potato recovery powder (RECOVER) and micronutrient dense greens powder (GREENS). Each scoop of the new sweet potato blend contains all of the micronutrients and nutrition of one sweet potato. Each scoop of the greens powder contains 18 servings of all organic vegetables. This is pureWOD's first campaign with Kickfurther. Click here to see the successful pureWOD offering summary information. Kickfurther is a leading inventory and invoice financing crowd-funding platform that connects companies with backers seeking qualified short-term deal financing. Our platform enables productive growth oriented companies seeking capital to finance production to share their sales opportunities with backers interested to put their money to work in short term profit opportunities in the retail supply chain. Businesses post offers by choosing the amount of inventory capital they need, the profit percentage backers will earn, and a projected timeline based on sales history. Since its 2015 launch, Kickfurther has funded more than $6.06 Million in 243 offers by more than 170 companies. Their backers have earned an average greater than 2% consignment profit per month on completed offers. For additional information, please visit www.kickfurther.com. 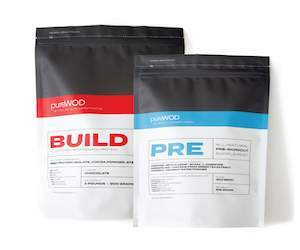 pureWOD started with an all-natural pre-workout. As they listened to their customers, they released a grass-fed beef isolate protein powder. Next up is a sweet potato powder for post workout carb sources and greens powder for micronutrient boost. They don't use any fillers, chemicals, or artificial anything in our products. All they want to do is provide what is missing: the most nutritious, chemical-free supplements on the planet.